StoryToys, the creators of Power Rangers Dino Charge game has recently released a brand new Power Rangers game for mobile devices “Power Rangers Morphin Missions”. The game features amazing challenging missions in which you play as your favorite ranger and complete specific tasks like investigating all generators, save all the students, protect the camps, and more. In this post, we have covered everything about the game you need to know: Power Rangers Morphin Missions guide and Power Rangers Morphin Missions tips, cheats & strategy to easily complete all the chapters & challenges. Before we head to the cheats, tips & strategy guide part, let’s learn about the basic aspects of the game. At the beginning of the game, only one ranger is unlocked. Rest rangers can be unlocked by completing the chapters. Missions are divided into the chapters. And there is also a challenge mode in which you have to complete the specific task in a fixed time. As you progress in Power Rangers Morphin Missions game, the difficulty level will also start increasing. As of now, the game features six-action packed chapters with amazing missions. In this part, we will learn about rangers, about attributes, CP, XP, Leveling up, chapters, challenges, diamonds, and much more. Power Rangers Morphin Missions game features six rangers. As stated above, at the beginning of the game, only one ranger is available; Tommy. You can unlock all the rangers by completing all the chapters. The player can increase these attributes using XP. XP can be obtained by completing the chapters & challenges. Constantly increasing these attributes helps you in defeating the enemies. Read the Power Rangers Morphin Missions cheats, tips & strategy guide below to learn how to complete chapters easily. After you complete a certain number of chapters in the campaign mode, challenge mode gets unlocked. In this mode, the player has to defeat all the enemies before the timer runs out. You can see the remaining time at the top-right side of the screen. XP aka EXP(Experience Points) is required to level up an attribute(i.e. health) of a particular ranger. Complete the chapters in campaign mode to earn XP. CP aka Challenge Points is required to play in challenge mode. You can earn CP by completing the missions in campaign mode. Diamond -> Diamond is one of the precious items in Power Rangers Morphin Missions game. You can use diamonds to obtain XP and CP. And you can also use diamonds as a recovering option in the missions and you can continue from where you left off. The player can earn diamonds by completing the chapters in the campaign mode. 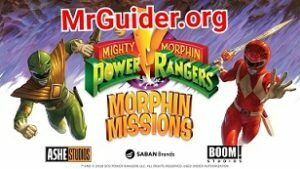 So, this is the basic Power Rangers Morphin Missions guide for the beginners. Now, let’s start the Power Rangers Morphin Missions cheats, tips & strategy guide. As stated above, the game becomes more difficult as you progress and it would be hard to defeat thousands of enemies alone. If you get stuck on a particular level, repeat the old chapters and earn XP. Use XP to upgrade the attributes of the rangers and then try again. While moving around the battlefield, look for boosters such as healing boosters & power crates. You can recover the HP using healing boosters and power-up by absorbing the power booster(open the power crate). As stated above, you can recover the HP using healing booster. But you should collect it at the right time. For example; if you HP status is fine, then there is no need to collect it. Collect it when ranger’s HP is at the low point. Similarly, you can use “power charge” skill by tapping on the ranger icon(at the left side). This power skill gets charged when you slay down the enemies. Once fully charged, just tap on the ranger icon to unleash the skill. As you know, XP is required to upgrade the attribute of rangers. One of the best ways to obtain a huge amount of XP is playing challenge mode. There is a huge difference between rewards you get by completing the chapters in campaign mode and challenge mode. So, if you repeat the challenges in the challenge mode, you can easily earn a lot of XP. After you complete a mission or a challenge, you have the option to double the amount of reward by watching a video ad, Don’t miss this offer, watch the video ad and get the 2X reward. You can exchange the diamonds and obtain XP and CP. Just head to the exchange tab -> choose the diamond quantity. As of now, you can obtain 2,000 XP using 200 diamonds and 100 CP using 600 diamonds. To go to the exchange menu -> tap on the XP bar at the top of the screen. So, these are some Power Rangers Morphin Missions tips and a strategy guide for the beginners. Keep upgrading the rangers & you are good to go.